MOSCOW, the Russian Federation (BulgarianMilitary.com) – Today (10th December), with a solemn ceremony, the Russia’s Black Sea Fleet accepted in service the latest Buyan-M class cruise missile corvette designed and manufactured under the Project 21631 – Orekhovo-Zuyevo. 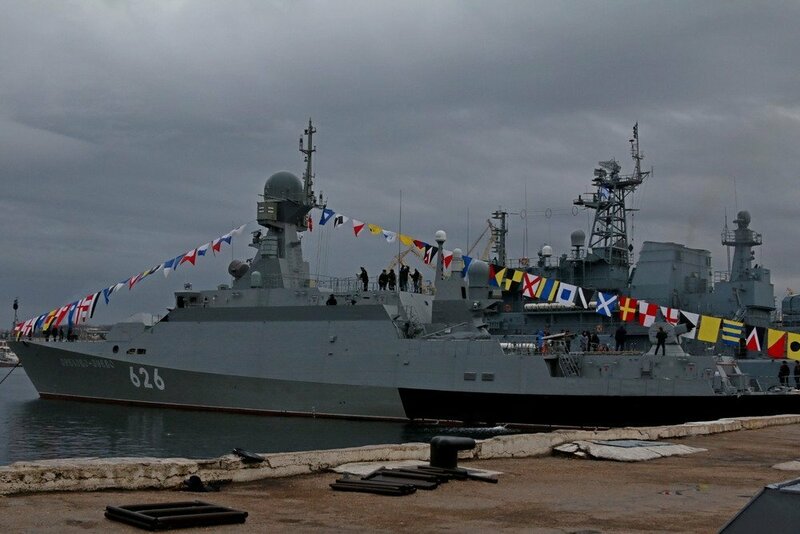 The commissioning ceremony was held on the board of the new warship, at its permanent base in Sevastopol, TASS news agency reported from the scene, learned BulgarianMilitary.com. The second of the Buyan-M cruise missile corvettes built for the Russian Black Sea Fleet, arrived in Sevastopol, at the end of the last week, to become part of its 41st brigade of missile boats, after the successful completion of the state-run sea trials. The Orekhovo-Zuyevo is the seventh multipurpose war ship of the Buyan-M class series that are equipped with the latest Kalibr-NK long-range precision weapons, which are designed to strike both naval and ground targets. Their armament includes also 100mm artillery guns A-190 and small-caliber antiaircraft artillery AK-630-2 Duet complexes as well as launchers of Gibka 3M-47 complex. Buyan-M class corvettes feature larger displacement of water and are used protect and defend Russia’s sea economic zone. At the end of the last month, the press office of Russia’s Black Sea Fleet announced that it expects, in 2019, to complete the construction, to conduct the state trials and to accept in service another two corvettes, developed under different projects and armed with Kalibr cruise missiles, and the sea tug Sergei Balk. Then, it was also reported for four warships and a boat, which are undergoing state trials and will enter service with the Fleet really soon. Among them was and the already commissioned missile corvette Orekhovo-Zuyevo, the others include the patrol ships Vasily Bykov and Dmitry Rogachyov, the ocean minesweeper Ivan Antonov, and a new fast-speed transportation and landing boat developed under a new project, all of them part of the Fleet’s modernization plan. The first Buyan-class corvette was designed by Zelenodolsk Design Bureau as a heavily armed gunboat that was constructed by Almaz shipyard facilities in St. Petersburg under the Project 21630. This class of corvettes was designed for Caspian Sea littoral operations conducted by the Russian Navy. The first ship of the class, Astrakhan, entered service with the Caspian Flotilla, in 2006. In 2010, a new Project 21631 for the construction of newly-modified corvettes that are a missile version of Project 21630 Buyan-class small-size gunnery ships, has been launched by the Russian Defence Ministry. The lead ship under the new project, Grad Sviyazhsk, was laid down in August, the same year and is called as Buyan-M-class vessel.